There are many different colors and opacities when dealing with decking stain. Before searching for a deck stain, you should determine the look you want. Some stains (solid colors) will completely hide the wood grain while others (transparent and semi-transparent) while allow the grain to show through, this is referred to as opacity. The higher the opacity the more pigmentation resulting in less wood grain showing. Color is the tint or hue a deck stain has. Many different colors and tints can be added to stain. The most common are natural wood colors, redwoods, and darker browns. Color is directly related to opacity. Lower opacity of a stain allows the wood's natural color to show through more while a higher opacity will hide more of the wood's color resulting in more of the stain's color or pigment to show. While all deck stains provide water protection, the more pigment a stain has the more UV protection it provides. A clear stain would provide almost zero UV protection while a solid stain would provide the most protection from the sun. 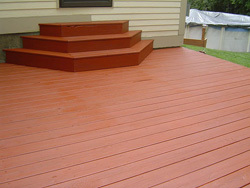 Opacity levels of deck stains are categorized as semi-transparent stains, semi-solid stains, and solid or opaque stains. Semi-Transparent - A semi-transparent deck stain provides a "see through" protective layer that allows most of the wood's natural color to show through. With semi-transparent stains, the pigment color can vary widely from deck to deck. A lot of times a color sample of the stain is only a general idea because the wood's natural color will affect the overall look of the deck stain. In general transparent stains will penetrate better into the wood, giving a more natural look to the wood. Semi-transparent stains are the easiest to maintain. In most cases they can be cleaned with a deck cleaner to remove dirt and grime then re coated without the need for sanding or stripping. If needed they can be stripped easily. Semi-Solid - Semi-solid deck stains will almost completely hide the wood grain and natural color. These stains provide more UV protection than a semi-transparent and are a better representation of the stain's actual color. Solid or Opaque - These types of wood stains hide the grain completely and provide the most UV protection. Solid color stains will “film” on top of the wood, masking the grain, while looking like paint. It should be noted that heavily pigmented deck stains are harder and normally more expensive to maintain. Unlike a semi-transparent that just fades away over time, solid stains begin to build up after several years of application making it necessary to completely remove or strip the stain to get back down to bare wood again. This requires a sanding, deck stripper, more labor, and expense. Understanding the differences between color and opacity and the differences of protection will allow you to choose the deck stain that is right for you. I recently bought a house with cedar shake siding and I'm unsure about which treatment would work best. I really like the natural cedar look but these shakes are 30 years old, the color all around is not uniform anymore (some areas throughout the siding are lighter/some darker/some bleached out) and I am looking for a finish that will protect the shakes the most for the longest amount of time. As a result, I feel like a compromise to all of these characteristics would be staining the siding with a semi-solid or solid body stain. I feel like this would take care of the unevenness so the shakes will end up uniform and the coating would last longer than any other type of stain so I wouldn't have to coat it every couple years. I would like to make the siding look as close to that natural warm new cedar color as possible without going the transparent/ semi transparent route due to frequent maintenance. Am I understanding this correctly? What type of stain would you recommend, semi solid or a solid? I am lost and unsure. I would like to make the right choice so my family and I can enjoy our new home for years to come, please help? Thank you for your time. Do not use a solid stain. It will not last any longer than a semi-trans or semi-solid. Thank you for the reply. I really appreciate your input. Do you really think the semi transparent would blend all the different tones? The house siding is almost a rainbow of different colors- some areas are very dark, some average, some light, and then some other areas are totally bleached out. A rep from Sherwin Williams’s said that if we go with a transparent or semi transparent, it would be unlikely that all of the different shades would blend evenly at the end of the project. I would love to go with something lighter like a semi transparent (it would keep the natural cedar look) but I thought it might come out blotchy due to the siding being old. I also heard that the more paint that is in stain the more protection the wood gets and therefore it lasts longer. I am so lost with this. This is really confusing. If you prep correctly then the wood should clean up evenly. Then that means it will stain evenly. will semi-solid stains fade away over time then u reapply which is what semi-transparent does or is it going to be more like solid stain and build up over time as you reapply so it will have to be removed some day and start all over? You have to stay with a semi-solid when reapplying and if you prep correctly each time, then you will not have a buildup to a solid looking color. You cannot apply a semi-transparent over a semi-solid.